Portrayed in this image from ESA’s Planck satellite are the two Magellanic Clouds, among the nearest companions of our Milky Way galaxy. The Large Magellanic Cloud, about 160 000 light-years away, is the large red and orange blob close to the centre of the image. The Small Magellanic Cloud, some 200 000 light-years from us, is the vaguely triangular-shaped object to the lower left. 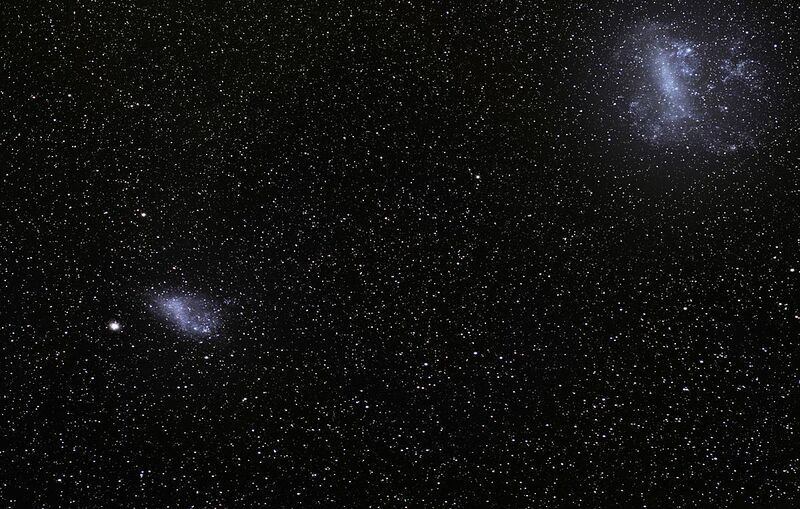 Seen from the southern skies, the Large and Small Magellanic Clouds (the LMC and SMC, respectively) are bright patches in the sky. These two irregular dwarf galaxies, together with our Milky Way Galaxy, belong to the so-called Local Group of galaxies. Astronomers once thought that the two Magellanic Clouds orbited the Milky Way, but recent research suggests this is not the case, and that they are in fact on their first pass by the Milky Way. The LMC, lying at a distance of 160 000 light-years, and its neighbour the SMC, some 200 000 light-years away, are among the largest distant objects we can observe with the unaided eye. Both galaxies have notable bar features across their central discs, although the very strong tidal forces exerted by the Milky Way have distorted the galaxies considerably. The mutual gravitational pull of the three interacting galaxies has drawn out long streams of neutral hydrogen that interlink the three galaxies. The Large Magellanic Cloud. CREDIT: C-141 KAO Imagery: Supernova 1987A (April 1987 – New Zealand Deployment) Large Magellanic Cloud; Photographer: C-141 Imagery; Date: Jun 23, 1987. PREPARED BY Adrian Pingstone in December 2003. The two-color image shows an overview of the full Small Magellanic Cloud (SMC) and was composed from two images from the Digitized Sky Survey 2. The field of view is slightly larger than 3.5 × 3.6 degrees. N66 with the open star cluster NGC 346 is the largest of the star-forming regions seen below the center of the SMC. A Hubble Space Telescope (HST) image of NGC 346. At around ten and seven billion times the mass of our Sun, respectively, these are classed as dwarf galaxies. As a comparison, the Milky Way and another of its neighbours, the Andromeda galaxy, boast masses of a few hundred billion solar masses each. The Magellanic Clouds are not visible from high northern latitudes and were introduced to European astronomy only at the turn of the 16th century. However, they were known long before by many civilisations in the southern hemisphere, as well as by Middle Eastern astronomers. Planck detected the dust between the stars pervading the Magellanic Clouds while surveying the sky to study the cosmic microwave background [CMB] – the most ancient light in the Universe – in unprecedented detail. In fact, Planck detected emission from virtually anything that shone between itself and the cosmic background at its sensitive frequencies. These foreground contributions include many galaxies, near and far, as well as interstellar material in the Milky Way. Astronomers need to remove them in order to access the wealth of cosmic information contained in the ancient light. But, as a bonus, they can use the foreground observations to learn more about how stars form in galaxies, including our own. Interstellar dust from the diffuse medium that permeates our Galaxy can be seen as the mixture of red, orange and yellow clouds in the upper part of this image, which belong to a large star-forming complex in the southern constellation, Chameleon. In addition, a filament can also be seen stretching from the dense clouds of Chameleon, in the upper left, towards the opposite corner of the image. Apparently located between the two Magellanic Clouds as viewed from Planck, this dusty filament is in fact much closer to us, only about 300 light-years away. The image shows how well this structure is aligned with the galaxy’s magnetic field, which is represented as the texture of the image and was estimated from Planck’s measurements. By comparing the structure of the magnetic field and the distribution of interstellar dust in the Milky Way, scientists can study the relative distribution of interstellar clouds and the ambient magnetic field. While in the case of the filamentary cloud portrayed in this image, the structure is aligned with the direction of the magnetic field, in the denser clouds where stars form filaments tend to be perpendicular to the interstellar magnetic field. The lower right part of the image is one of the faintest areas of the sky at Planck’s frequencies, with the blue hues indicating very low concentrations of cosmic dust. Similarly, the eddy-like structure of the texture is caused primarily by instrument noise rather than by actual features in the magnetic field. 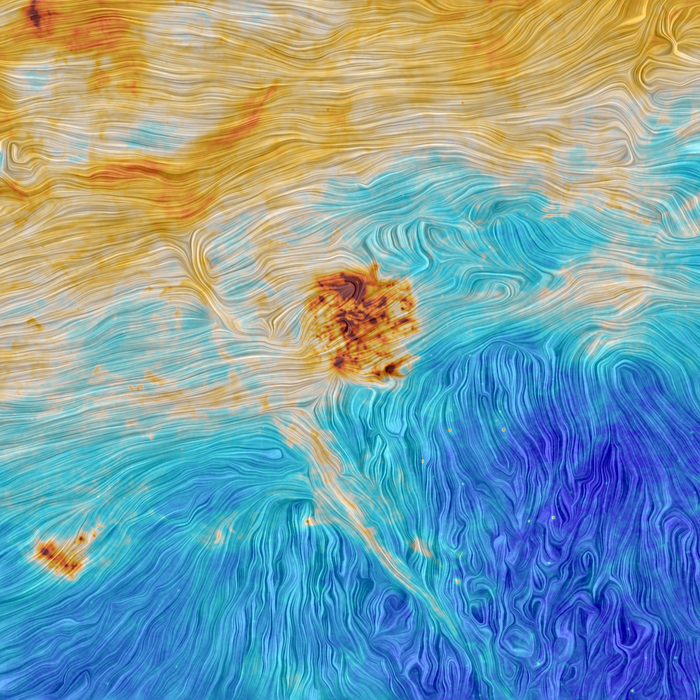 The emission from dust is computed from a combination of Planck observations at 353, 545 and 857 GHz, whereas the direction of the magnetic field is based on Planck polarisation data at 353 GHz. The image spans about 40º.